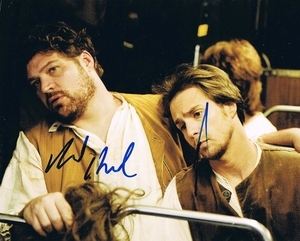 We never sell copies or reproductions of any kind; this photo has been hand-signed by Sam Rockwell & Brad William Henke. Sam autographed this picture at the Sundance Film Festival in Park City, Utah on January 22, 2013. Brad signed this photo at the Tribeca Film Festival in New York City on April 23, 2011.